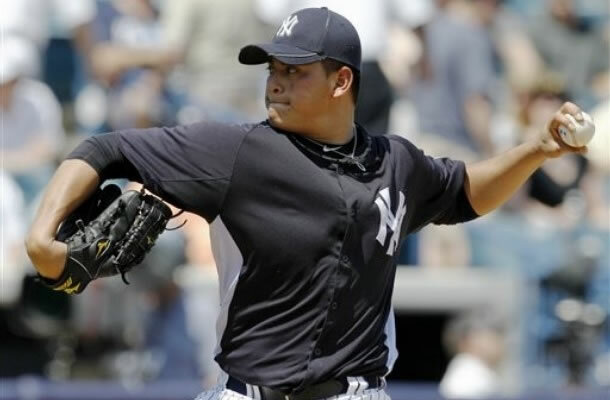 Manny Banuelos was, at one point, the Yankees’ most highly touted pitching prospect. We haven’t really written about him as a major league option in almost two years. What happened to him, and what does his future hold? Let’s talk about that for a little while, shall we? Just what kind of stuff did Banuelos show off to inspire such high praise from a legend? First of all, he’s left handed, which everyone in baseball is always enamored with. Secondly, he threw gas. At his best, Banuelos was throwing routinely 90-94 mph, with top speeds of 96 or so. That’s impressive for a lefty, especially one that’s only 5’10” and 175 lbs. Think of a left handed Pedro Martinez type of guy. The ball exploded out of his hand. Banuelos also had a nasty changeup, that clocked in around 80 mph, a full 10-15 mph slower than his fastball. That kind of changeup in such a young pitcher is not as common as you would think. He also featured an improving curve ball, but that was not yet major league ready back then. The wheels kind of fell off in 2012, and injuries were to blame. Manny came into Spring Training for the second time and, while he was not expected to compete for any major league roles, he stuck around well into the spring, pitching extremely well and turning lots of heads. However, a series of injuries eventually led him to undergo Tommy John Surgery, and he missed basically all of 2012 and 2013, his age 20 and 21 seasons. Those are incredibly important seasons in a pitcher’s development, so you can imagine the disappointment he, the Yankees and their fans must have felt. Despite all of that, Banuelos is back on the scene and looking to reestablish his value this spring. He appears to have his health back as well. Although he didn’t pitch in any actual minor league games last year, he’s been working and throwing simulated games since the fall, and is allegedly looking good. It is being said that he has been clocked in the 92-94 mph range, while still showcasing that effective changeup and getting his breaking balls over for strikes as well. b.
Manny will definitely not be competing for a major league role this spring, but he will be trying to get himself back on the Yankees radar. 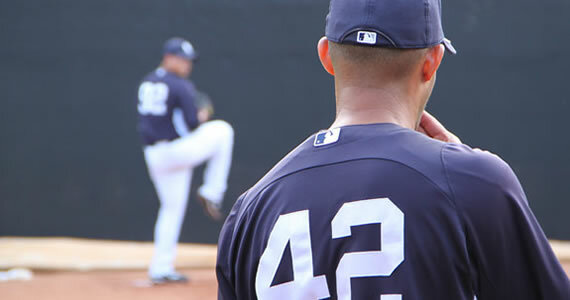 If he can return successfully, and stay healthy, there’s no reason to think we won’t see him in the Bronx some time in 2014. The Yankees’ rotation is expected to be made up of at least one out of Michael Pineda, David Phelps, Adam Warren and Vidal Nuno. If anyone gets hurt or falters, and Banuelos puts up a few big months in AAA to start the season, why wouldn’t the Yankees bring him up for a spot start? The kid will still be just 23 this season, which would make him four years younger than Phelps, three and a half years younger than Warren and Nuno and two years younger than Pineda, so he’s far from a bust, or a failed prospect. Who knows, maybe he and Pineda get healthy, and the Yankees end up with two of the best young pitchers in all of baseball come 2015… wouldn’t that be nice? 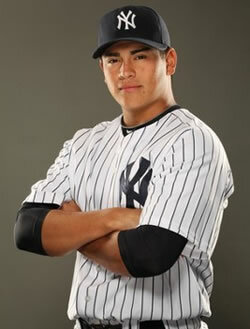 I, for one, can’t wait to see him in the Bronx. I put the over/under on his debut date at August 13th. Any takers?